Are you a local Stampin' Up! demonstrator (Edmonton, Sherwood Park or surrounding areas)? As of August 1st, we as demonstrators, were able to order from the holiday catalogue! Woohoo! But it's summer... who wants to spend their time inside crafting when you can be outside enjoying the beautiful weather. That's what this event is for! Let us help you get a jump on your fall events at the Holiday Catalogue Pre-Order Party! 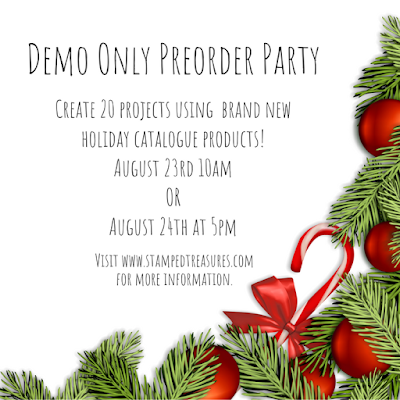 Imagine after an afternoon of crafting with other demonstrators, having 20 samples created using brand new holiday catalogue products! 20 projects to share at your upcoming events, use in your classes, for displays or for personal use! Payment and registration is due by August 12th. Payment can be made by etransfer, PayPal, Visa or MCRD. Email sherry@stampedtreasures.com to register today!